This is a home business by Wait List and Appointment only. For information on how to get estimates and being placed on my wait list scroll down the HOME page. 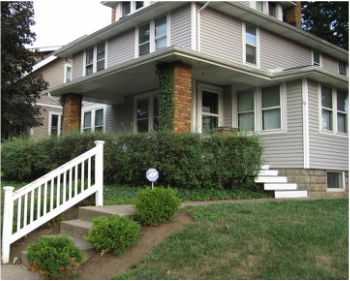 19 E Longview Ave is located in the Clintonville neighborhood of Columbus, OH. E Longview Ave is 2 blocks south of North Broadway and runs east off of N High St.
From 315 northbound: Exit 6A / North Broadway/Riverside Hospital. Turn right onto North Broadway. Turn right onto N High St. Turn left onto E Longview Ave. 19 E Longview Ave is the first house on the right. From 315 southbound: Take the North Broadway/Riverside Hospital exit 6 and turn left onto Olentangy River Rd. Turn immediate left onto North Broadway. Turn Right onto N High St. Turn left onto E Longview Ave. 19 E Longview Ave is the first house on the right. From I-71: Exit 114 North Broadway and turn west on North Broadway towards Clintonville. Turn left onto N Hight St. Turn left onto E Longview Ave. 19 E Longview Ave is the first house on the right. All parking is free street parking. Our neighborhood was built in the early 1920s with no driveways. Employees and customers of the many N High St businesses tend to use our street for parking so it can be busy during meal times and weekends. Unfortunately I do not have any control over who parks where. Be aware that the closest parking spot may be up a house or two or on the opposite side of the street. If there are no parking spaces on the street you are welcome to park in front of our garage behind our house- accessed by the alley next to our house. Please bring all chairs up to the front door. If you need help carrying the chairs, doing stairs, or have mobility issues please let me know so that I can make arrangements to assist you.